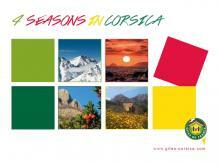 Whether you wish to book a holiday rental in Bastia, Corsica, or to see Corsica in all its rich variety, Gites Corsica is at your service. Here are some ideas for tours to take in the Island’s finest tourist destinations. The Mediterranean is miraculously beautiful, so why not travelling from beach to beach via Calvi, Cargese, Propriano, Porto Vecchio and Moriani? Each town has its particular charm, whether you are seeking to relax or to engage in sports of all kinds, from swimming to sailing and much more. A rental in Corte, Ile Rousse or Bastia, Corsica, makes the ideal starting point for those wishing to visit the stunning wild and natural surroundings of the Balagne region. A drive from Bastia, towards Corte and Bocognano takes you through the prettiest villages and delightful glades of chestnut trees. Then finish your trip around Alta Rocca, which boasts the villages of Aullène and Carbini, and the amazing prehistoric site of Cucuruzzu.